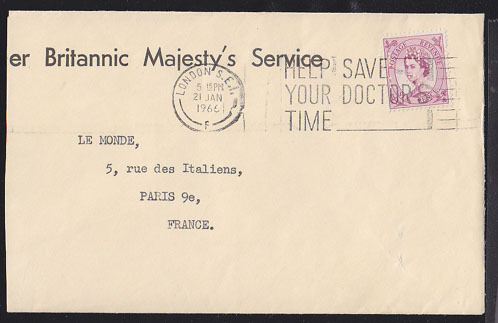 10632 OBL GREAT BRITAIN (1966) Help Save Your Doctor's Time. Cancelation on envelope franked with 6 p perfin (looks like "M O". envelope reduced at left. 10399 OBL GREAT BRITAIN (1967) Man on horseback*. 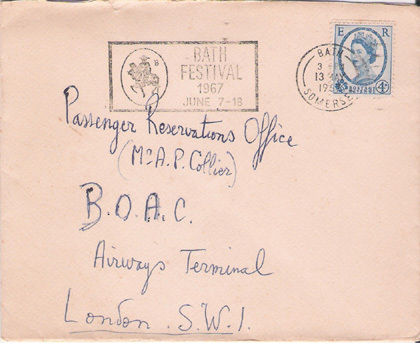 Illustrated cancel commemorating 1967 Bath (Music) Festival. 9423 OBL GREAT BRITAIN (1969) Thomas Hardy. 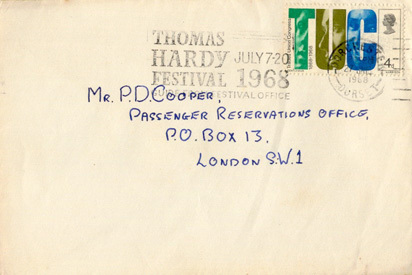 Commemorative cancel for Thomas Hardy Festival (40th anniversary of death).